What began as a multimedia jazz experience, a combination of straight ahead jazz music and series of photographs by the band's instigator and producer Ivan Grlić, soon evolved into a live video extravaganza with video projections that run in the background whenever the band is playing live. First there was a book with photographs, which were screened as well behind the band. But now, Grlić is sharing the stage with the band equally improvising on stage by manipulating various videos and visualizations onto the screen. Serendipity feels like a second chapter and it's always a good sign when a studio recording has the verve of a live album. Much of the music on this recording has had its premiere at the 30th anniversary of the Belgrade Jazz Festival where the combination of visuals, jazz music and excitement resulted in an event that tingled and entertained all of the senses. Unlike the band's debut, which was more heavily influenced by folk music, this has a jazz inflicted, vibrant, and uninhibited approach on subtle folk melodies with a very personal feel to it. As a recording it displays all the power, chops and verve one could wish if the preference is melodic and intricate jazz. What Serendipity has is something many records lack: varied textured. The music ranges from the fast bopper "Brad Meets Tozovac"or the fast paced funk tracks such as "Nearness of Distance," which is ornamented with a gypsy styled saxophone lines, and "Off Road" to gentle tracks such as "Flowering Wonder" or "Rainy Days." The fast paced tracks enhance the material with a sense of urgency while the slow tracks like the aforementioned, including "Ruse Kose," "Known Place" and "Titans from the Park" slope away from the fast paced to reveal a more gentle and unhurried side and playing to this band. 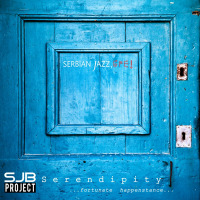 The secret weapon of Serendipity is pianist Aleksandar Jovanovic Shljuka who is the composer on most of the tracks. Shljuka is a player with a deep sense of camaraderie and his ecumenical nature really shines in his compositions and arrangements. What he brings to the table is virtuosity and subtlety to bear on this intriguing set of original and occasional traditional material. Inspired by his band mates he paints a delicate jazz-ethnic palette of music from their native Serbia, but in measured parameters. The ethnic influences are carefully interwoven within the phrasing, the melodies and occasionally there will be a hint as subtle as a nuance. The album is somewhat heavy on quieter stuff and ballads, and this recording closes with the gentle and slowly pulsing solo piano piece "South Wind." This record is a step forward in the same direction that the band's debut headed towards. Serendipity is filled with sonic delights and grooves and subtle melodies. It is full of enjoyable compositions that are delivered with skill and verve by a very talented musical unit. Track Listing: Brad Meets Tozovac, 9PM, Nearness of Distance, Flowering Wonder, Rainy Day, Known Place, It Should Sound Like This, Off Road, Ruse Kose, Titans from the Park, South Wind. Personnel: Ivan Grlic: producer, author, video art, VJ; Aleksandar Jovanovic: piano, keyboards; Max Kochetov:alto and soprano saxophone, Rastko Obradovic: tenor saxophone; Marko Fabry: music producer, electric bass; Aleksandar Cvetkovic: drums; Uros Secerov: percussions; Petar Krstaic: double bass.